Monday night was full of stellar highs and surprising lows as competition between the top six heated up on "The Voice." With only a handful of shows left to win the crowds, the six hopefuls performed two numbers — a coach selection and a personal selection — leaving some puzzled by the song choices. Adam Levine and Blake Shelton took reins of their teams, with the recently eliminated Christina Aguilera watching from the sidelines. Also missing in action for the coaching sessions was an ill Cee Lo Green, who was replaced by guest mentor Train frontman Pat Monahan. 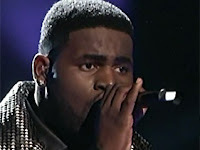 Trevin Hunte, The prodigal singer astounded audiences with his first rendition of the up-tempo track "Walking on Sunshine." Levine admits being surprised when he saw the track on the night's set list but eventually touted Green's "genius" for the selection that showcased a whole other side of Hunte. Of course Hunte's night hit a peak when he sang his own selection, Jennifer Hudson's "I'm Telling You I'm Not Going." The risk paid off when Hunte received a standing ovation from Green — "I would like a moment of silence to mourn the loss of the entire competition," he said — and Aguilera, who offered to take Hunte under her wing after the show was over. If that wasn't enough Levine went on to say the performance was the best the show has ever seen. Nicholas David, The soul of Team Cee Lo opened and closed the show with his unique groove. Despite scoring the coveted spots, David was not a stand-out of the night delivering his usual flair in both the coach select of "You Remember" and his personal selection "Somewhere Over the Rainbow," a song dedicated to his mother. While Shelton called his work "magic," there was nothing particularly memorable about his performances, as witnessed by Xtina who encouraged the talented singer to change it up. Cassadee Pope, Her Cassettes are cheering, we're sure. Overall frontrunner Cassadee Pope went back to her pop rock roots with an interesting arrangement to Shelton's pick of the song "Stand." Aguilera praised the singer's "chops" and went on to say, "You're an all-around true star of the show." The already-chart-topping Pope further impressed the judges with her song choice, Avril Lavigne's "With You." "You can't teach, coach somebody to have a connection with a lyric," Shelton praised the rockette, and Levine revealed it was his favorite performance of hers yet. Terry McDermott, Pristine rocker Terry McDermott delivered another consistent set of performances of "Stay With Me" and the challenging "Do You Know What Love Is." But McDermott had nothing to worry about as the judges were full of their usual praise for the Scotsman. "You're the real thing," Green said. McDermott, who has rarely received any criticism, was questioned about one thing, though, from a Twitter fan who asked him if he was a hobbit. Shockingly, he said no but we're not sure if we believe him. The resemblance is uncanny. Amanda Brown, One half of Team Adam held her own last night, coming in close second to the top. Amanda Brown had the crowd, and Cee Lo Green, smitten with her performance of "You Make Me Feel Like a Natural Woman," exuding joy that can't be faked. The judges had been waiting for her to have another "moment" like when she sang "Dream On," and she finally achieved it. The accolades didn't stop there. Brown took a risk, showing off her range with the rock song "Here I Go Again." Green called her his "favorite mistake" and Aguilera kept it equally simple by saying it was "really great." Melanie Martinez, "The Voice" darling Melanie Martinez had a tumultuous night in comparison to her competitors. The crowd favorite was encouraged to channel her youthful, playful side by singing "The Show." Singing in front a Sesame Street-like set, the usually brooding Martinez looked uncomfortable and unable to connect to the song. Aguilera suggested she look at the repertoire of Fiona Apple and embrace her sultry side instead. Her rendition of Gnarls Barkley's "Crazy" also encountered pitch problems but Green sweetly supported the young singer for putting a "great" twist on one of his songs.